Many folks were disappointed when Apple's big press event which saw the launch of the new iPhone earlier this month failed to reveal anything on the MacBook front, as the company's laptop range is certainly due a refresh. But fret not, the latest from the Apple rumor mill is that the MacBook Pro revamp is coming late next month. Of course, we've previously heard speculation that new MacBook Pro offerings are due to be revealed in October, and this fresh rumor indicates that the overhauled notebooks will be ready to roll and available in the second half of October. This one comes from MacRumors and seems a stronger source than any of the previous chatter from the grapevine, given that it's based on work which is underway on Apple's new desktop operating system. Apparently macOS Sierra version 10.12.1, the build Apple is currently working on, is all about preparing the OS to support the new hardware which will be on board the MacBook Pro. Primarily, that's likely to be support for the rumored OLED 'touchbar' which will replace the function keys at the top of the keyboard, and will be able to display different functions intelligently based on the current app being used (so, for example, if you've got Spotify running, you'll get media playback controls). Touch ID integration is also expected, and that'll need support as well. The deadlines being set to finish this version of Sierra are tight ones, and that's to ensure the software is ready for the launch of the new MacBook Pro models later next month, we're told. The overhauled laptops are expected to be released in 13-inch and 15-inch models, and will be thinner than ever and make use of USB-C ports, although that's hardly a surprise on either count. 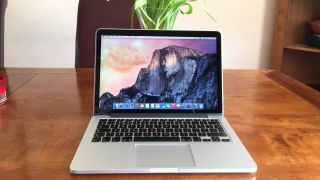 AMD graphics (Polaris) are expected to be an option, and were apparently chosen due to their thinness which will help the MacBook Pro achieve its svelte profile. A specially crafted metal injection molded hinge has also reportedly been employed in the quest to slim down the machine. There has also been speculation that the aforementioned Touch ID feature will be integrated into the power button of the notebook. Oh and as for colors, gray, gold and silver will be your choices – again, remember that all of this is according to the rumor mill.